~Main bit of evidence starts from the ground. I leave the NY Times deal with the struggle to explain basic science dismantled by ignorant politicians. 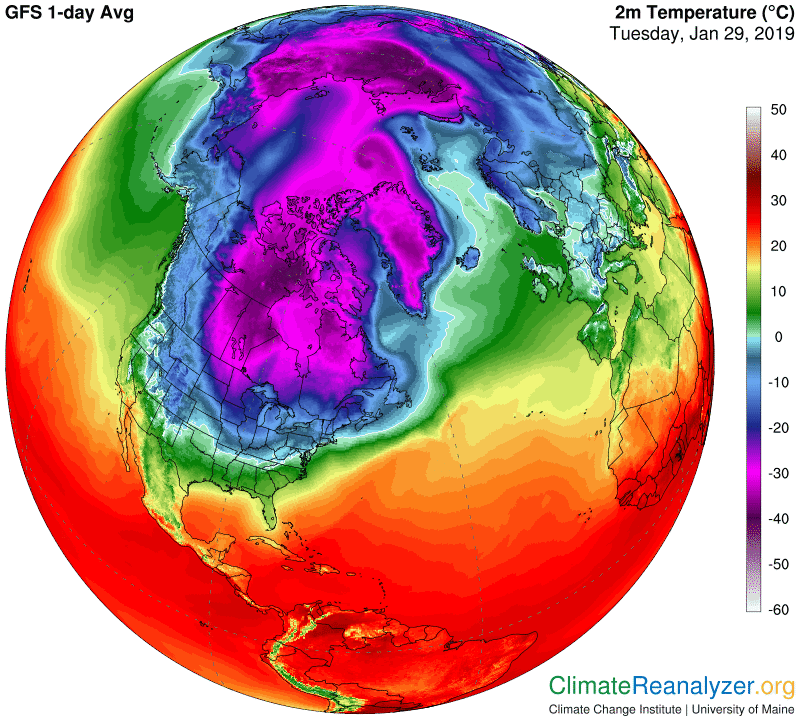 But the Times also have ably described the return of a particularly cold dreaded Polar Vortex, which unbeknown to many Americans, has visited Canada a couple of times already (some parts of Canada's neighborhood as well). In a truly normal winter, say pre 1990's, a cold wave would have hit Florida by now, instead of slowing down its Southward advance at the 'wall' of a warmer USA. The question still lies, why so much colder? University of Maine 2 m temperature basically displays as cold surface air South of the Canadian Arctic as in the Arctic. 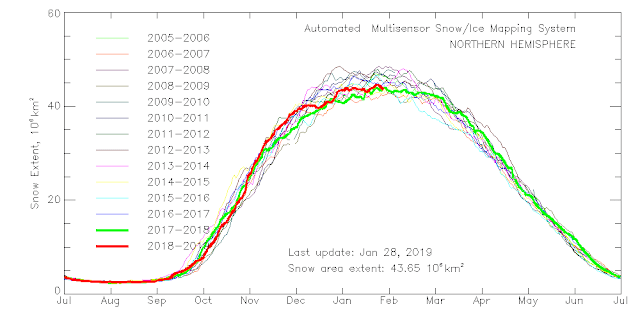 Here is the biggest indice: December 2018 was warm, very warm, with the Cold Temperature North Pole in Northern Russia. Warmer in winter can only mean less snow on the ground especially in the great continental interior lands. 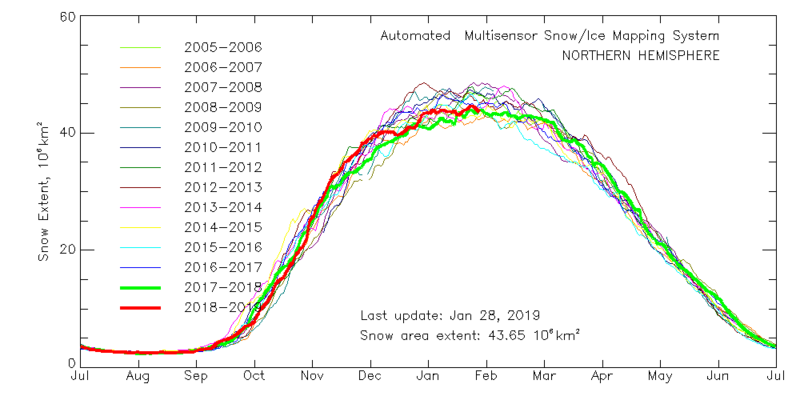 The latest cutting edge refraction observations have revealed the main reason why this years vortex gathered strength even if not expansive: less snow on the ground. This has been observed optically, all confirmed with thermistors. The heat capacity of soil is less than air, thus soil barely covered by snow during days with very low sun elevations twinned with lesser cloud extent, guaranties rapid cooling. These two geophysical facts feedback on each other, colder air implies less snow, no winter clouds provides colder air. These two create anticyclones, long lasting high pressures during winter darkness create incredible cooling. This January 29 2019 CMC IR picture gives an idea of how much snow on ground there is, not much throughout North America. 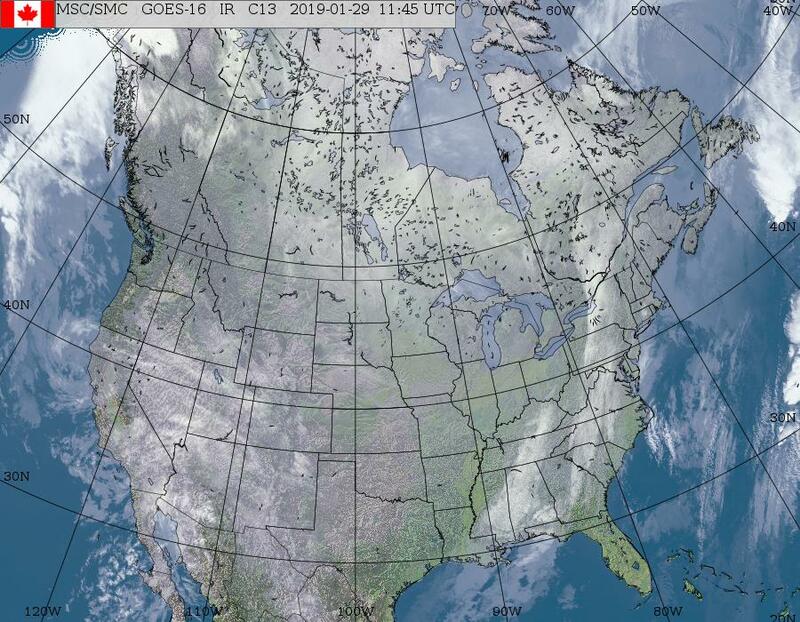 There is less snow in North America than Eurasia, it is to date, a meek snow cover year.